The starting point for any social enterprise is to be clear on what you are trying to achieve, what is your motivation and how you will go about doing it. Your social enterprise needs to have a clearly defined brand and business brief which communicates what it does, how it does it and why it does it. A social Enterprise is distinguished from a conventional business because it is established to tackle a problem or promote a cause as its primary intention. Tackling that problem or challenge becomes the organisations’ ‘social mission’. Ultimately, you will want to identify some challenge or problem that you want to tackle; the more you plan and really think about what outcome you wish to secure, the better your organisation will be. As social enterprises are fundamentally no different to normal businesses (apart from their social mission! ), you should put all that the organisation intends to do in a business plan. A business plan may appear daunting. It may also appear that a ‘business’ plan is not necessary for your social enterprise. But all profit seeking and non-profit organisations need a purpose and a plan to execute. Planning the vision, goals and strategy of how to run your business will give you and your team the information you need to perform successfully everyday to achieve the end goal. The process of writing a business plan will usually be produced before you begin your social enterprise, with updates added when changes are made to the core of how the social enterprise is run. For example, let’s say that you decided that your target market for your coffee stand was festivals, but in the end, you opted to sell outside office blocks in Cork city. There are different target markets, maybe different pricing, possibly there is a staffing issue. This would require you to go return to your plan and ensure you will still make the social enterprise sustainable. If you have a board or other cofounder or you have identified some more experienced people to join with you in creating the business plan, make sure that you are able to reflect their input. Having more people involved does not automatically mean the idea will be better and more successful, but you might hear a range of opinions that can make the plan, and therefore the social enterprise, stronger. It is recommended that you keep your business plan to a few pages, excluding your supporting documentation. It is best to make sure that the plan is adequate and is detailed enough for action. Make sure that it both reads and looks well by sharing it with more experienced people who might be able to offer some advice on it. This Toolkit will examine all of these topics. While this Toolkit will address the larger questions, please make sure that you research widely and ensure you are tackling an issue and generating a plan that will actually work. If you are looking for an outline business plan, we recommend that you go to the www.localenterprise.ie website. Download the questions that are required of a priming grant and feasibility study. It will really help you to look at what funding bodies require from a social enterprise plan. 2.2 What is your big idea? When it comes to your social enterprise it is important to think about it in its simplest form. We will identify a need or an issue, we will look at how we can address it, then we will see what difference we could make. The following exercise is designed to explore your idea from a few different angles and establish if there are any gaps in what you want to achieve as well as identifying what knowledge you already have. Write down the need or issue as you see it in three different ways. List three ways that you might know on how to help address those needs/issues. We will explore all of these issues more through this Toolkit, so let’s get started. Social enterprises often come down to the question ‘Why?’. This question is generally what sets them apart from a regular business. Frequently, social enterprises emerge from a passionate belief or the identification of a need that you believe you may be able to supply. Your issue or your cause can be a social, environmental or economic issue that needs to be tackled. It is important to identify to whom are the beneficiaries. Beneficiaries are those that will primarily benefit from your social enterprise. One of the best ways to understand the need for a service or product is through personal experience – if you have had to deal with an issue personally you’re going to have an understanding of what is the need. Perhaps you’ve encountered something in your life that has impacted adversely on people. Perhaps someone close to you has experienced difficulties that could have been better addressed. However, while you’ll have to make sure you don’t assume your experience is the same as everyone else’s; having this insight is truly valuable. If you don’t have personal experience you will have to work harder to gain personal insight. You will have to do your research and spend time with the people who do have experience of the issues you are trying to tackle. To showcase the importance of this issue, it is useful to gather statistical evidence to identify the issues and negative impact being caused by this problem. It is very likely that you will need to use this statistical data to raise awareness and educate your different audiences about the cause and encourage their attention and support. You will need to understand the issue you are trying to face to understand it better. You will need to focus on the components of your cause. Let’s start with a simple exercise. We define beneficiaries within this toolkit as people or organisations who may benefit from your products or services e.g the homeless, kids in social care homes, young people, etc. What costs are there to reaching them? You can simply start your social enterprise, but without a clear direction or setting achievable tasks, you will be more likely to fail than succeed. It might seem like a step back to commit your own thoughts to paper, but getting people on board with your idea and making calculated and informed decisions, prevents you from losing money, losing time or worse still, by aggravating or adding to the problem you are trying to fix. A vision really gets to the ‘Why’ of your organisation. It is useful to start there. Most social enterprises emerge from personal experience and first-hand witness to injustice or maltreatment. Spending time to fully think through the idea and the implications prevents mistakes from happening and gives a robust structure to ensuring the vision is transformed from an idea to a social enterprise. If you want others to join with you, you must start with your clear vision. It has to be clear, it has to be achievable and it has to be somewhat realistic. You might say your vision was: ‘To create a world in which every child is free from bullying.’ This is the change you would like to see in the world. Consider that you are not telling anyone how you are doing it. Just that you want to make this impact. You can have an unrealistic vision, for example: ‘to prevent all types of bullying forever’. I think we would all like to see this as true but it might not be possible with your social enterprise. So make sure that the vision could be attainable and somewhat realistic. Otherwise, you will never fulfill your vision which can be off-putting and of less use as a statement. Specific – addressing one issue, need or community. Bold – and cannot be delivered quickly. Feasible – because people have to believe it can be achieved. Work on developing the words and phrases that best describe your social enterprise. Make sure the time frame is within the next 5 to 10 years. When you are getting underway, you will always get asked about what you do or how you do it. Stories are your key to getting across complex international issues, as people can relate more to a personal journey rather than an issue that may not affect them. Think about it this way: which is more interesting, listening to the methodologies and psychological tools that can be used to prevent bullying in a complex environment or telling the story of a child who overcame a challenge, and whose life is forever changed because of your social enterprise. People are invariable moved by relatable personal stories. And, those stories are more likely to get retold. Practising your story is an excellent way to capture people’s imagination and to communicate your ideas. Imagine you have been given four minutes to give a talk on your social enterprise. You are endeavouring to convince people of something that needs to be done and you have been given an opportunity to present your solution. What is the impact of your solution? Now that you have got a vision, you need to work on how it will be achieved. A mission statement is much more focused on giving a brief insight into the internal workings and objectives of your project. Your mission statement has to be short, specific and measurable. It expands on your vision statement, informing the reader how you plan to deliver the change you believe is required. 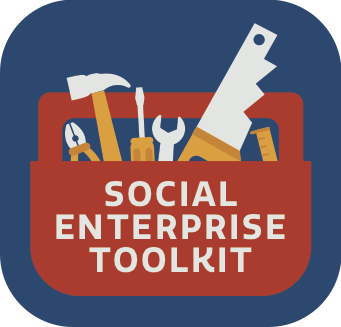 In social enterprises, you can also have it described as your ‘social mission’. If you have a social enterprise, your mission statement will naturally be focussed on your social causes. The objectives of your organisation detail how your organisation will achieve your aim. Your objectives are a list of activities you plan to deliver. All of your objectives should be SMART. The values of your organisation communicate the ethos and motives of your organisation. Many companies believe that their values are more important than your vision or other statements. Values can speak to culture within your social enterprise and can be pretty important in taking the time to outline. For example, a value could be to trade ethically. This might mean that you only use ethical products. These products could be of a higher cost. But if it is truly important to the social enterprise, you have to make a choice. It might be a value to deliver the best possible cost to your clients. In this case, more quality materials will not be chosen as they are generally dearer. Values are only meaningful if they are adhered to. For example, if a company states that they treat all employees with equal respect, but they are demonstrably hurting one set of employees over another set, then people will not believe them anymore. Values therefore must be believable. What are your values for your organisation? Write down those values that you think are most relevant. Here are some to get you started. Now that your social enterprise is beginning to take shape, it might be a good time to start thinking about your brand and your brand identity. A brand is the design of your products and services as distinct from other competitors. It can include the shape and size, colour, texture, quality and other attributes that makes your social enterprise different. Having as much information on your organisation, your target market, the message you want to convey and the way that your social enterprise is packaged is really important and you should think carefully before finalising what your social enterprise will look like. Design is important. If you feel you are not the best person for the job, consider getting a professional to help you. Outside support and influence can make a huge difference. Who is most likely to buy your products and services? What does your competitor brands look like? Is your service to look affordable, an average price or is it a luxury brand? For social enterprises, there is also a major question: should you include your social mission as part of your brand or not? For example, if you are a social enterprise cafe, should you advertise the fact that you are a social enterprise, or should you allow people to find that out themselves? Let’s say you have an accessible cafe that caters for hiring staff with physical disabilities. In this instance, it will be important to note, that those in wheelchairs will be working in that space. You will have to consider how that will make them feel. So whether you choose to lead with your social mission or not, is a question that needs to be right for your organisation. Try and answer the following questions on your social enterprise. 2.6 Is there a need? Need to drink to survive. Water alone can meet this need and, in most of the world, is freely available. Demand and pay for colas, beer, tea and coffee. They don’t need them but choose (or are persuaded by marketers) to demand and pay for them. Your social enterprise will have to consider how best your product that you are selling matches with the need you are trying to fulfill. For example, If you make and sell food products, does that same food also feed your beneficiaries. The more successfully you can align demand with need, the more sustainable your social enterprise will become. Ultimately, a social enterprise needs to operate like a business. It needs to sell products or services that customers are willing to buy in order to achieve its social mission directly or indirectly. All of the retail products and services need to compete within the marketplace so they must demonstrate high quality, unique selling points and innovative qualities to attract people’s attention. Which of the following are you going to do? When you are planning the best approach, getting the right balance is very important. You could find yourself running two different businesses rather than just one which, in turn, requires a completely different business strategy. It is therefore important to take all of this into consideration when planning your social enterprise model. When making or selling your product or service, you must bear in mind the ethical considerations and when it comes to social enterprises, how much though you are putting into the decisions that are made is important. Consider selecting materials or tools sourced from sustainable sources; for example reclaimed, recycled, organic, sustainable farming etc. Irish: If you are an Irish product you may investigate marks that push the Irish brand as a selling point. Quality Standards: If you are trading in an industry, there may be industry standards that you could sign up to. Bord Bia currently run an Origin Green standard for food companies. Trading standards: Whole organisation standards such as the B Impact Assessment from the BCorp model world wide might be of interest for more profit seeking organisations. BCorp standards try and move companies from being best in the world to being best for the world. All standards usually come with auditing standards and each one will be associated with a cost and the time and costs in getting to match their standard. Many of these quality assurances are meant to be trusted brands and they can usually offer advice and guidance on how to improve your organisation to make sure that they meet the goals and standards.